Micronor prescriptions are currently not available via our online consultation service. You can, however, request an online consultation for birth control. 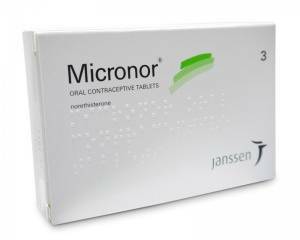 Micronor is an oral contraceptive pill. The tablets are known as the 'mini-pill' (containing only progestin). You use Micronor to prevent pregnancy. It is a one-phase pill, there are no monthly bleedings anymore, but there may be occasional spontaneous bleedings. Once or twice a year is normal. You take the pill, in the form of a tablet, daily, without any intermissions, for 28 days. Micronor is offered in strips of 28 tablets, and each of them are marked with a day of the week. Follow the direction of the arrows on the strip and start your next strip the day after the end of the previous strip. You start taking the pill on the first day of your menstrual cycle (first day of your period). Note: Take the pill everyday at the same time, inconsistent use may alter the contraceptive effect negatively. Healthy women who do not smoke virtually run no risk of serious side effects. Sometimes, however, some experience side effects. If these persists for longer than three months, it makes sense to contact a doctor. The following side effects may occur when using Micronor. A contraceptive pill will not protect you against sexually transmitted diseases. It is important to ensure that Micronor is the right contraception for you.Gedarel is suitable for most healthy young women, but it should not be taken when you are pregnant. For a complete list, see the leaflet in the package. The birth control pill Noriday contains the same active ingredient. Primolut N tablets are used for the treatment of menstrual disorders and contain a high dose of norethindrone.